Happy February! I’ve been on a mission to get my kitchen organized and refreshed this week and thought it would be fun to add some color to help lift us out of this winter slump. Anyone else feeling blah? My friend Aimee posted this colorful kitchen photo from Target’s catalogue and I immediately knew it’s the vibe I’ve been craving. Perhaps a little daring for the neutral-lover in me, but accessories are always a safe bet because they’re relatively inexpensive and easy enough to change up. 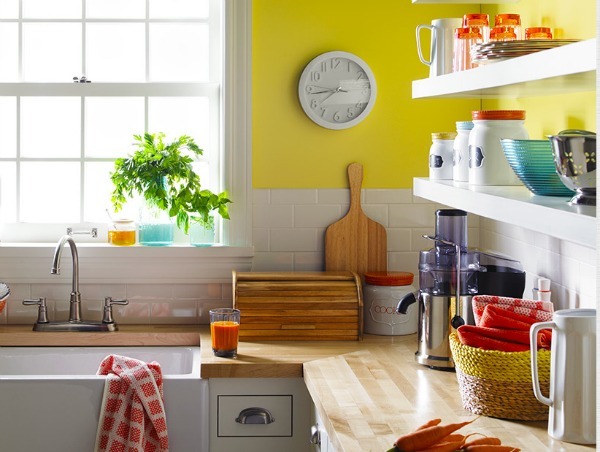 If you’re daring and like to live with vibrant color year round then I won’t stop you from painting your kitchen a bright yellow. My client Fiona did and she loves the cheeriness it brings to her space even on the dreariest of days. If you’re like me and that kind of commitment scares you, then perhaps dots of color here are there are your best bet found in kitchen decor. After searching for some colorful kitchen accessories earlier this week, I was excited to come across some fun storage canisters, ceramic baskets and tea towels I plan on purchasing. I also found a bunch of other ideas that may be a good way to liven up your kitchen. Have you done anything to brighten up your space this winter? How do you like to inject color? so fun! in our old house i wanted to do knobs like that but i never did. :) i love the fun touch! Thanks Cassie! Those pictured are drapery finials, but knobs would look fantastic, too. Enjoy your weekend! Yes, I have the the winter blahs!! It’s been raining a lot so little sun and this colorful post made me happy! When the sun shines the cold weather is easier to take, for sure. Get some rest this weekend! I love this kitchen, but I’m too scared to try something like that in my home. I tend to lean towards neutrals. But the accessories are great, and a great way to add the color without the long term commitment, like you said. I’m exited for Target too! Neutral gal myself, but adding a little color here and there is fun. Lemons, limes, and flowers are always a nice way to add color without committing. I definitely have the winter blahs as well. I’m so happy it’s Feb because that means it’s almost spring:) I had a yellow living room in our house in Toronto and I loved it. In fact, everyone loved it. The mailman, the pizza delivery guy. It was truly amazing how many people commented on the colour. Have a great weekend Shauna! In our last house the living room was Benjamin Moore’s Vellum and we loved it. The room gave off a warm glow at night and was beautiful with the fireplace on. I’ve gone in a different direction in this house- whites, blues, greens, tans and greys. Sounds a little boring, but we like it. That’s the tricky part. Are you digging any particular color right now? 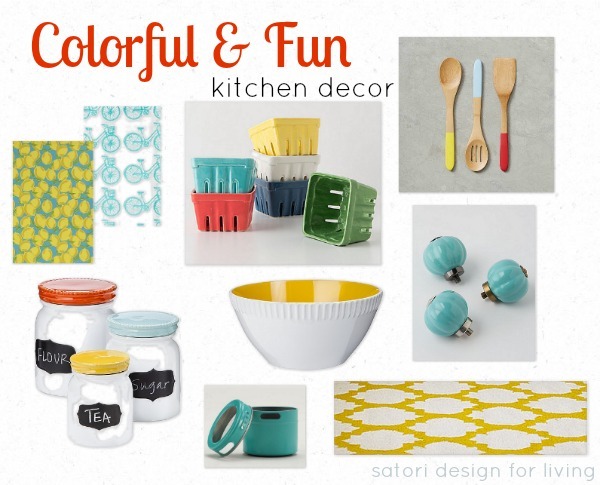 Currently I am designing a very light and bright kitchen for my new home. These bright accents will be perfect! I am also putting the cabinets in the walk in pantry myself to save some money and planning to paint them to look more custom. I am hoping to paint them a striking color for a bit of a surprise when you walk in. Sounds beautiful! Are you building in Calgary? I’d love to see pics when it’s done! Yes, we are building about 7 blocks away from our current home in West Springs, in West Grove Estates. We could plan a coffee with your sister and my sister (in-law) someday and you could see it in person. It is a custom design and I can hardly wait! Should be moving in July. Sounds like a great plan! Good luck with the build! I’ve been drooling over their catalogue for a while now and can’t wait for the store to open this spring. It’s been long overdue!